– 25 min from the Marseille / Marignane airport. – 20 min from the TGV train station in Avignon (shuttle bus possible). 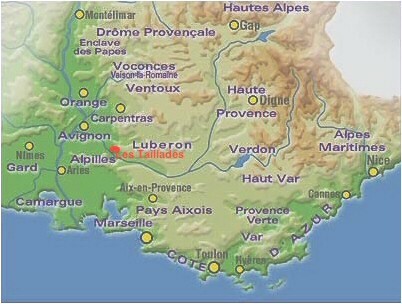 – 8 min from Exit 25 of autoroute A7. -From Autoroute A7 (Paris – Marseille) take exit 25 > Follow direction Cavaillon > At the traffic circle at the entrance of Cavaillon (Mac Donald’s) take to your right direction Apt / Carpentras > Pass 4 traffic circles and you will arrive at a traffic light (Auchan Supermarket), take to your right the D43, direction Les Taillades > At the traffic circle at the Renault garage, take to your right the D31, direction Cheval Blanc / Vidauque > Drive 250 meters, take to your right the Chemin des Croix Rouge, then it’s the two gate on your right.